Quartier Petit Champlain in Old Quebec City is an area declared as a UNESCO World Heritage Site and people to the area can wander the shopping district during the evening hours. As night moves in over Quebec City, the soft yellow lights in Petit Champlain illuminate the cobblestone streets and the historic buildings dating back to the mid-17th century. Window shopping at night is a romantic way to spend an evening after dining at one of the elegant restaurants found at Quartier Petit Champlain. This shopping area is one which can become very busy during the tourist season as people wander amongst the heritage buildings while shopping through the unique boutiques and designer stores. 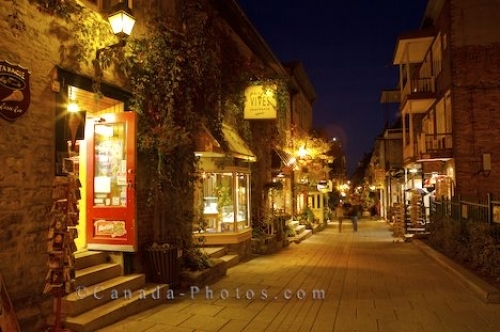 Picture of the serenity at night in Quartier Petit Champlain, Old Quebec where a couple of people do some shopping. ... hours or the night time hours are the best times to really enjoy the beauty of the Quartier Petit Champlain in Old Quebec, Quebec City in Canada. Petite Champlain, Quartier Petit Champlain in Old Quebec, Quebec City, Quebec, Canada. UNESCO World Heritage Site.